When the Game Stands Tall (2014) – What's New on Netflix Canada Today! 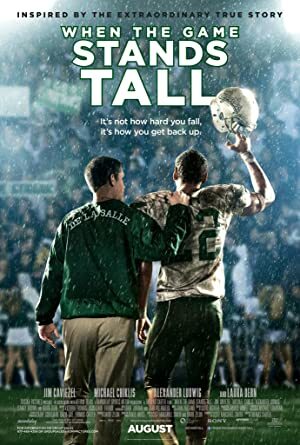 Inspired by a true story, WHEN THE GAME STANDS TALL tells the remarkable journey of legendary football coach Bob Ladouceur (Jim Caviezel), who took the De La Salle High School Spartans from obscurity to a 151-game winning streak that shattered all records for any American sport. After a record winning streak ends, a high school football coach challenges his players to pull together when tragedy threatens to tear them apart. All great football teams crash eventually. Only the greatest find a way to get up again — and prevail. Like this one.